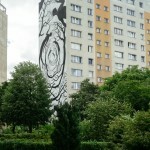 These artists from Spain deliberately chose a wall hidden behind trees. 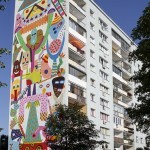 The mural shows the community of humanity as a network, a system close to the order which prevails in nature. According to the Spaniards, man is still a part of nature and regardless of the development and technological progress, this is his final refuge. 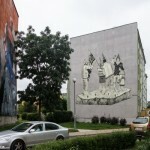 Zosen Bandido has created his own mythology, covering the walls and canvases with fantastical figures, whose names, histories and mutual relations are known only to the artist. His work in Zaspa, as he says himself, is a “bestiary” of his imagination.